Allergies are among the most common of medical disorders. It is estimated that 60 million Americans, or more than one in every five people, suffer from some form of allergy, with similar proportions throughout much of the rest of the world. Allergies are an over-reaction of the body’s immune system. The immune system is made up of a network of cells, tissues, and organs that work together to protect our body. A properly functioning immune system is the biological warfare unit for the body, protecting it against harmful substances: substances such as bacteria and viruses and toxins and parasites. While the function of the immune system is reasonably simple to understand, how it works is complex and intricate. The immune system normally recognizes and reacts to foreign substances called allergens. Allergens are harmless to most individuals; pollen is a common allergen. For many people, the common allergens don’t cause any problems. But in a body with allergies, the immune system overreacts and treats something fairly harmless, like an insect bite, as something really dangerous to the body. Allergens enter the body through four main routes: the airways, the skin, the gastrointestinal tract, and the circulatory system. 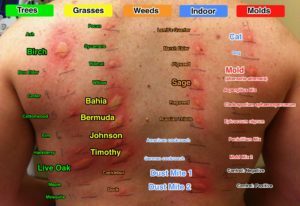 The most common airborne allergens are plant pollens, animal fur and dander, body parts and excrement from dust mites (microscopic creatures found in all houses), excrement from cockroaches, house dust, mold spores, cigarette smoke, solvents, cleaners. Common food allergens include nuts, especially peanuts, walnuts, and brazil nuts, fish, mollusks, and shellfish, eggs, wheat, milk, food additives and preservatives. Common causes of skin allergies include poison ivy, oak, and sumac, nickel or nickel alloys, latex. Insects and other arthropods whose bites or stings typically cause allergy include bees, wasps, and hornets, mosquitoes, fleas. The following types of drugs commonly cause allergic reactions: penicillin or other antibiotic, flu vaccines, tetanus toxoid vaccine, gamma globulin. When the immune system of an allergic body recognizes an otherwise innocuous substance as harmful, it does many things. One of those things is to release chemicals to fight off the allergen. One of the most well known of those chemicals is called histamine. The allergic body’s immune system attacks the substance with a ferocity far greater than required. 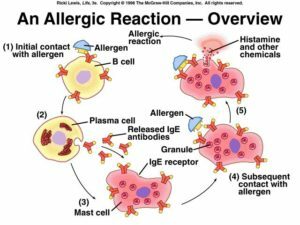 This all-out attack by a whole bunch of bioactive chemicals is what causes the clinical signs of an allergy. With skin testing, small amounts of allergens are injected into the skin and the reaction is measured at intervals from 30 minutes to 48 hours. Swelling at the site of injection indicates a positive result. The time at which the reaction is first noticed gives an indication of the type of hypersensitivity that is involved. Beta-glucan is a fairly new supplement, but it is commonly used to help fend off winter bugs. Research shows that the nutrient does influence aspects of the immune system through a few different roles. It can help stimulate certain aspects of protection for the immune system [Source: Bedirli, Engstad, Dennehy]. It also seems to help keep the immune system from overdoing it, avoiding further damage to the organs after an infection [Source: Bedirli, Preus]. One study showed that supplemental beta-glucan could actually benefit allergy symptoms [Source: Yamada]. The immune system is under constant pressure to attack any possible invaders, but avoids being overstimulated to the point that it chronically causes swelling and congestion. Beta-glucan can aid allergies by balancing effects on the immune system [Source: Kirmaz]. The common dose used is 500 mg 1-2 times a day. Effects of glucan treatment on the Th1/Th2 balance in patients with allergic rhinitis: a double-blind placebo-controlled study. Beta-1,3-1,6-glucan is an immunomodulator stimulating particularly the antitumor response. An efficient antitumor stimulation can be achieved through a Th1-mediated immune response. In this study, beta-glucan may have a role as an adjunct to standard treatment in patients with AR (read more).